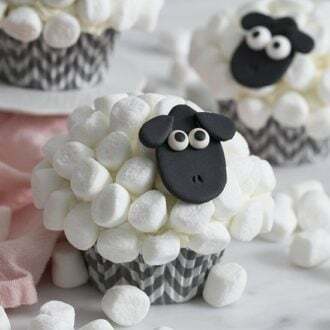 These cute and delicious sheep cupcakes have, marshmallow fur, an easy to make fondant face, and the whole thing sits on top of a moist and rich chocolate sponge base. What could be better than a startled sheep perched on top of a cupcake? These little treats are really easy to make and as a bonus, completely delicious! I made a batch of my ultra-moist chocolate cupcakes, smeared some vanilla buttercream on then placed my marshmallows. Boom, 95% done! The faces come together in a snap but if possible make them a day ahead so they can dry out. Marshmallows and buttercream and cake make for a perfect bite; it’s something about the various textures working together. So even if you don’t make these sheep try it out on your next cake or cupcake! I love Wallace & Gromit and of course Shaun the Sheep, and these cute sheep cupcakes just so happen to look like him! These are a perfect treat for spring or Easter gatherings. You can pair them with my Easter Bunny and Baby Chick cupcakes for a full spring-time spread! 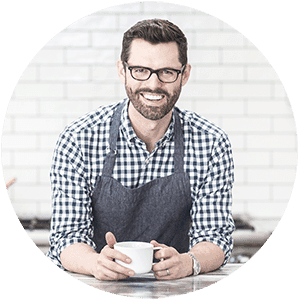 Not a fan of fondant? Try using modeling chocolate for the faces. Sniping off the tip of the marshmallows you’ll be pressing onto the buttercream helps them stick better and not fall of later. 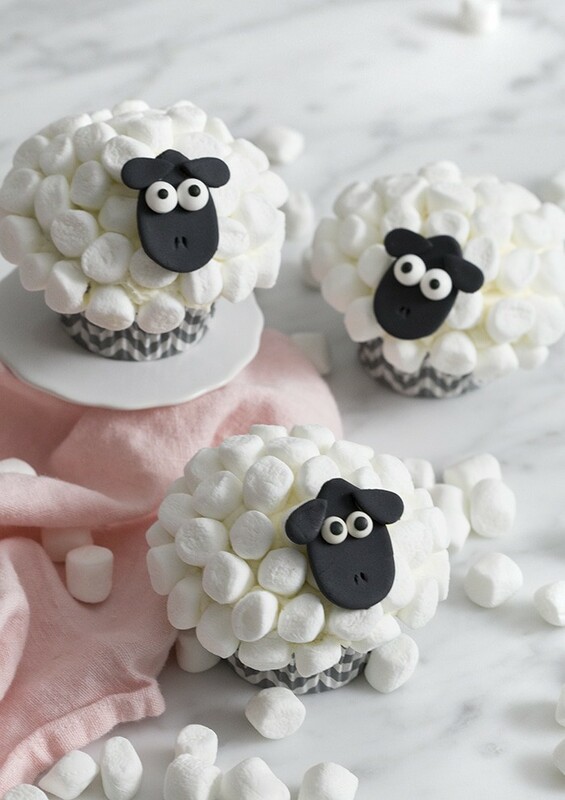 How do You Make Sheep Cupcakes? For the cupcakes; prewar the oven to 350F and add papers to a cupcake tin. Sift the dry ingredients (including the sugar) into the bowl of a stand mixer and whisk to combine. Add the wet ingredients into a large bowl and whisk them together. Combine the wet with the dry and mix until smooth. Distribute the batter evenly into the cupcake papers and bake for about 15-20 minutes then allow time to cool. For the vanilla buttercream; In a standing mixer fitted with a paddle attachment, beat the butter until it’s light and fluffy. Sift the confectioners’ sugar into the creamed butter. Once incorporated, add vanilla, salt, milk, and transfer it to a piping bag when done. For the assembly; use food coloring to dye the fondant black and roll it out to make a thin layer. 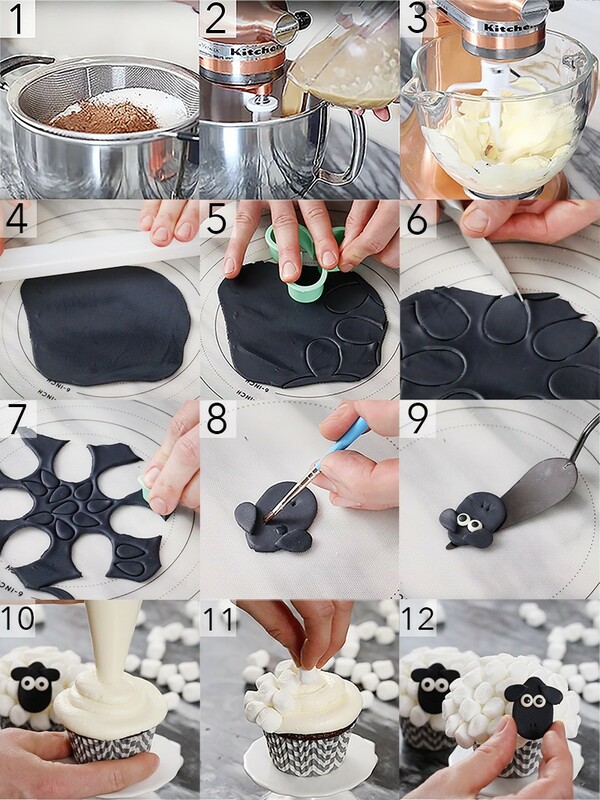 Use an oval shaped cookie cutter to cut out the heads of the sheep. It’s okay if you don’t have a perfect oval shape or the correct size. You can modify it with a small knife, like I did! With the left over fondant, use an even smaller oval shape to cut out the ears. If you need to, gather the access fondant into a ball and roll it out again to get another thin layer. Use a small paint brush to gently brush a small amount of water onto the fondant where you want the ears and eyes to be. When your sheep head is assembled, carefully set it aside and allow it to harden up a bit before you place it onto your cupcake. Once your cupcakes have cooled, grab your piping bag filled with buttercream and pipe it onto your cupcake. Right after you pipe the buttercream on, lightly cover it in mini marshmallows to create your sheep fur. When you’re ready to put the sheep face on, pipe a small amount of buttercream on the back of the head so it sticks. Enjoy! IF YOU LOVE THIS EASTER RECIPE TRY THESE OUT! 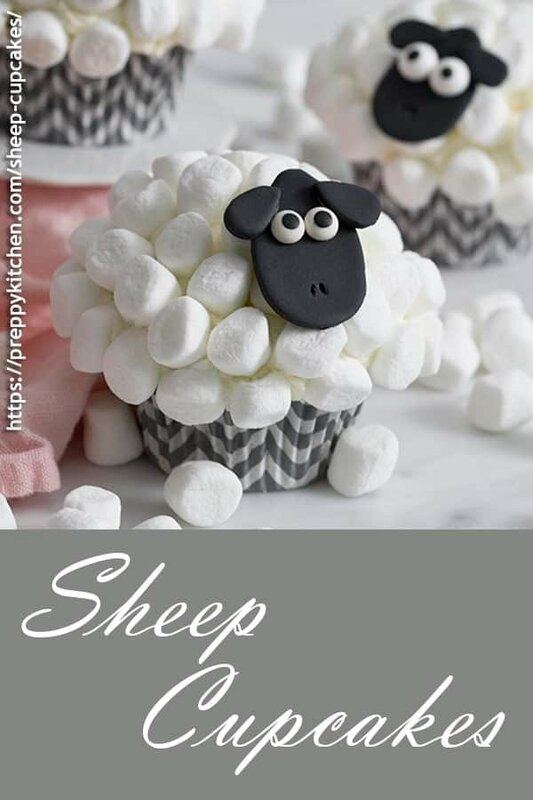 If you’ve tried these sheep cupcakes then don’t forget to rate the recipe and let me know how you got on in the comments below, I love hearing from you! 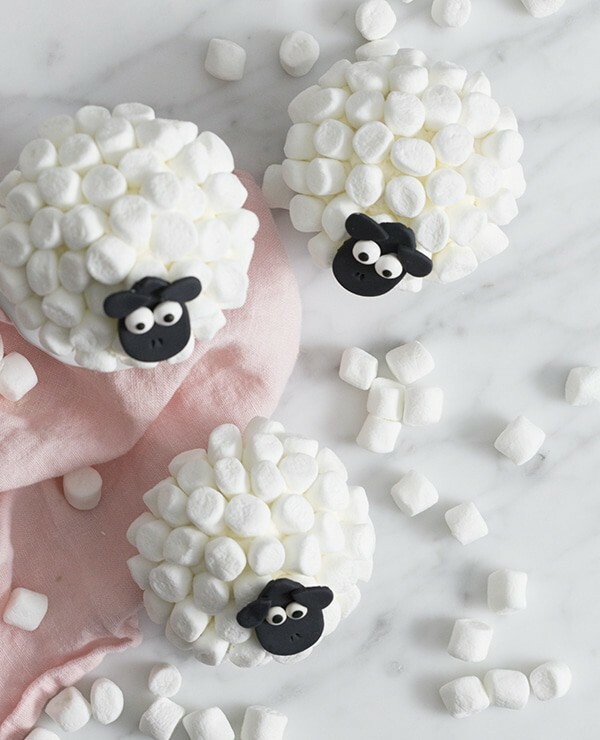 These super-cute sheep cupcakes with mini marshmallow wool and an easy fondant face will delight all your guests! Use food coloring to dye the fondant black. Roll out the fondant to make a thin layer. Use an oval shaped cookie cutter to cut out the heads. and an extra small oval shape to cut out ears. Brush water on the fondant to make the ears and eyes stick to the head. Pipe the buttercream onto your cupcake. Lightly cover with marshmallows then place the sheep face on. Sniping off the tip of the marshmallows you'll be pressing onto the buttercream helps them stick better and not fall of later. I made these cupcakes with my niece and she didnt want to eat them because they were so cute! She just started playing “farm” with them. I snuck a couple though and they were delicious 🙂 Thanks for all your recipes!